17 posts categorized "Carnivore Heroes"
Roger Moore may seem an unlikely Carnivore Hero, and indeed, my affection for him stems primarily from his stint as James Bond (another Carnivore Hero for another day). I'm also fond of Moore because he was born and raised in the neighborhood where we now live, and is charmingly proud of it. Moore, however, merits the title Carnivore Hero because of his affection for the gourmandic arts (i.e., eating a lot). Moore begins an interview with the Sunday Times by noting "you can tell that I’m a pig because my memories are all about food, taste and smell." Although he's being a little disingenuous (his memories are also about rhesus monkeys and circumcision), the Carnivore Project is duty-bound to salute any former Bond and local boy who so proudly highlights his love of food. For the past three weeks, we've been ushering out of town guests around London, showing off the local landmarks (Smiths, St John, The Eagle, Smiths again, The Eagle again, Smiths for a third time and Neal's Yard Dairy). (Also spotted: a museum). As you can imagine, a roving pack of transatlantic gluttons can intimidate the service industry, but we've had two examples of carnivore heroism that deserve mention. The Onion A.V. Club, one of my favorite web sites, runs a regular feature called the Taste Test, where they try all those foods you've always wondered about. You know the ones - the dusty cans at the grocery store; the knock-off candies at the local dollar store; the stuff your weird great uncle Ralph brings to family pot-luck BBQs. This week they tried pickled pig lips and Cajun Crawtator chips, in what might possibly be one of the best taste tests ever. It was certainly a most worthy moment in the glorious history of meat-eating. Noted one taster: "It's not the taste, it's the texture. It's all chewy and kind of mooshy and gooey at the same time. It's got little bits of gristle that get caught in your teeth, so the flavor just lingers." Well done, A.V. Club! You are Official Carnivore Heroes. The Carnivore Project has a new favorite team - the Omaha Beef. The Beef are in the ninth year of professional football, playing as part of the United Indoor Football Association. Home games are played at Omaha Civic Auditorium, nicknamed (I love this) "The Slaughterhouse" and their mascot is "Sir Loin". What's not to love? Not only the Beef, you know, the Beef - they're also really good. After a hard-earned road win over the Sioux City Bandits (laaaaaame), the Beef are riding a seven game winning streak, and sitting (at 8-2) with the best record in the league. GO BEEEEEF! Support the Omaha Beef at www.beeffootball.com. Note: The Omaha Beef are only the new favorite real team of the Carnivore Project. The favorite imaginary team will still remain the Kansas City Beef, of the London House Rules Fantasy Football League. 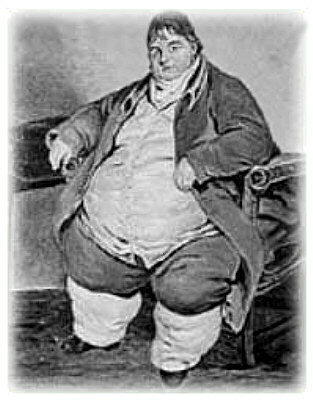 If even half of what they say about Daniel Lambert (1770-1809) is true, he would still weigh 26 stone. He's gone without mention so far, but Anne's cat, Pickles, has now been residing with us in London for several months. 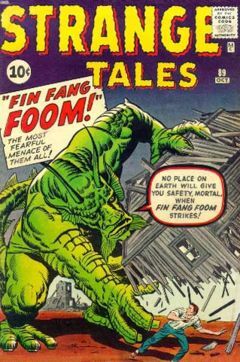 One of Jack Kirby's peculiar nightmares from the early 1960's, Fin Fang Foom is a massive dragon, based loosely on an Occidental bastardization of Chinese mythology - or, more likely, a commercial desire to emulate the Godzilla property. He lies dormant for centuries, is awakened by Standard Monster-Awakening Causes (nuclear weapons, hikers, evil corporations), romps around for a while - generally bellowing his own name - and then is put back to sleep by the local superhero fortuitously (and invariably) locating magic herbs. Of all the bizarre Marvel monsters, Fin Fang Foom is arguably the most surreal. He laid dormant for decades (in reality, that is), until, bizarrely, now. Apparently there's something about the big green dragon in purple pants that resonates, against all odds, with the modern comic book reader.